Since its inception in 2003, it has the most popular brand of the Cohiba cigarettes, known in its strong taste, similar to the Cuban Habanos. It is 100% black Cuban tobacco. The history of the Cohiba brand dates back to 1966; when an outstanding cigar-maker hand-rolled cigars for Fidel Castro, the Cuban president, who later proposed that the production be taken factory scale, with women workers only. The name Cohiba was his secretary’s idea; meaning tobacco, in Cuban Indian. 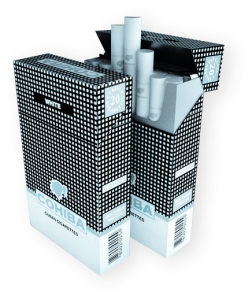 In 1987 Cohiba cigarettes were introduced for the first time, and in 2003 they were launched across Latin America, the Carribean and Russia, becoming as a global brand from 2006. Cohiba Premium cigarettes inherited the brand and produce the finest cigarettes made from 100% Cuban tobacco got from the prestigious lands ofVueltaAbaja, carefully selected to give the best taste and aroma with distinctive history. COHIBA ORIGINAL is the best choice for those who need to get in touch with history. Also known as the favorite, it offers a balanced smoke due to its perfect blend of the finest Cuban tobacco with 60% virginia and 40% black, both of which are original Cuban tobacco. When Christopher Columbus “discovered” Cuba, the native Cuban people called tobacco Cohiba. Currently, it is a world renowned tobacco brand. 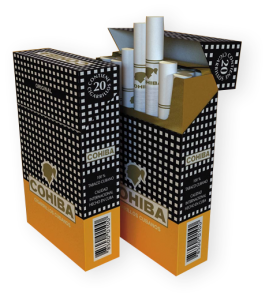 Cohiba Premium class cigarettes took over the local market in 1987 and slowly but steadily got into the international market. Made in 2011 specifically for those who needed a light smoke with a tinge of strength that is characteristic of Cuban tobacco, Cohiba predilecto is the perfect blend that delivers the right balance. It offers the ideal balance for smokers who are after a unique aroma and taste while also appreciating the prestige and the quality in the cigarette. Developed from Cohiba original, it is its smoothest version, with an exclusive and delicate flavour with 70% virginia and 30% black. Cohiba is one the world renowned cigar brands and its roots can be traced back to the ancient fifteenth century when the tobacco was first known as Cohiba by the native people. However, it did not really emerge until after 1966. 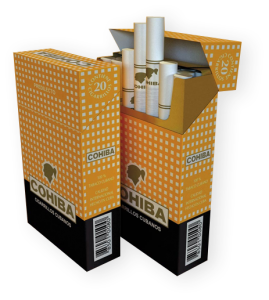 Mass production of Cohiba Original cigarettes started in 2003, and later on added CohibaPredilecto to the mix. The CohibaPredilecto was famous for its infusion of quality and aroma. It is in this same spirit that Cohiba brings you a new brand- Cohiba White. Delicate, subtle and distinctively Cuban, these ultra-mellow cigarettes are the smoothest of the Cohiba range and offer a lighter option for those who enjoy the exclusive taste of the best tobacco in the world.It is the touch of perfection that every smoker needs. With its slight smoke puff, it gives a pleasureful sensation that one gets only from the best tobacco in the world. © Copyright 2017 Magnum Asia Limited. All Rights Reserved.